These signs are called pole signs, and they’re important for businesses. 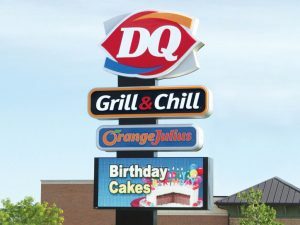 Pole signs are one of the best ways for businesses to get more customers. All a customer has to do is see the giant sign while traveling and they’ll be more likely to visit the business. These permanent signs stand up under any condition and make a business known to anyone, sending out the message that the business is open and ready to serve. At Schaefer Sign Works, pole sign design is taken seriously, which is why we are the best local company for the job. 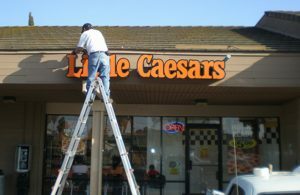 Our workers are very cooperative and can create signs for you based on your preferences and install them. These signs get more people to come to your business and make you more money in the long run. Call Schaefer Sign Works today at (317) 934-2575 for a Free Consultation with a Pole Sign Expert! When a cabinet sign is attached to a 20 foot or more pole, an illuminated pole sign is born. This genius creation works best at night because the light is a sure fire way to have people looking at the sign. They can be seen close up, or miles away from their location. Investing in one of these signs is a commitment that will ensure profits for the future. It’s easy for the cost of these signs to be recouped in a short time. An on-site evaluation may be necessary for some businesses, as not everyone will need to have one of these signs. Call Schaefer Sign Works at (317) 934-2575 to get a free consultation for your business. Pylon signs and their offshoot known as tenant signs don’t share the same height as pole signs, but they serve the same basic purpose. There is a plus side for these two signs over pole signs in the form of being able to have more information. The base of these signs are wider, and the materials that are used to build them are heaver. 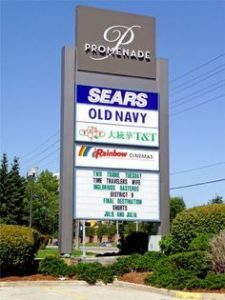 When it comes to advertising in a complex, tenant signs are the best option, because they can feature the names of every business located in that area. Shopping centers have these signs most of the time, along with business parks. If you need help deciding on a sign, all you have to do is contact us and we can help you figure out which signs will boost your business. Schaefer Sign Works has the best experts in the business to make pole signs for you. Everything will be done by us, including installation and cleaning. At Schaefer Sign Works, we experienced enough to make signs that businesses can use to increase their customer base. Best sign company in Indianapolis!